While the original SynthMaster Player enjoyed a lot of popularity, I was always disappointed that we didn't have the full version on iOS. All of that changed last week with the release of SynthMaster One! This is a full port of the desktop synth, with all of the synthy bits exposed for play. So... Let's Play with it! Contest: I have 3 copies of SynthMaster One to give away! This post is going up on Thursday as a Patron Early Access Screening. The winning codes will go out on Saturday. This gives non-patrons a chance to enter on Friday, but they're going to have to be fast because I'm closing this early Saturday morning. Contest closed! Congratulations to jimhanks, colorofdubious, and Frozen Lonesome! KV331's first iOS app, SynthMaster Player, came out 3 years ago as a way for people to explore popular SynthMaster presets. But it lacked all of the fun synthesis elements. 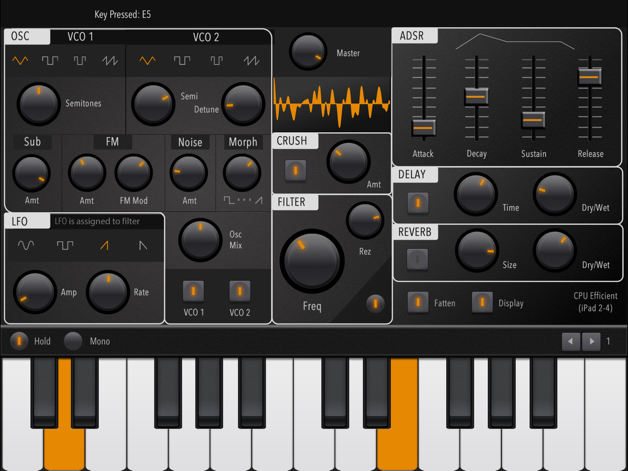 Finally we get the full version of SynthMaster on iOS with SynthMaster One! WWDC 2018: Moar liek YAWN 2018, amirite? Yesterday's WWDC was the first one I missed the live stream for since I began discchord! I was distracted by my own development. I wanted to finally make the search bar in the menu actually search when you click "search" from the iOS keyboard. So it does that now. Apple didn't have anything new to show, so here is a picture of a ridiculously cute kitten. I'm looking at that and I'm like, "How are you so tiny, kitten?" It seems physically impossible for some reason. Like a little ambulatory fluff ball. Goddamn that is just so adorable. Instead of showing pictures of kittens, Apple wasted a lot of people's time with more nonsensical animated emojis. The only people who can use these are iPhone X users, and the only people that would want to are kids. So some very rich kids are probably happy with this year's WWDC, but if you wanted any new devices or functionality you're out of luck. Apple were so pressed to fill time that they spent 10 minutes on Augmented Reality Legos. Seriously. I had other things planned for this week, but when iceGear released Kronecker on Monday all of those plans changed. Every single iceGear app is a new world to explore, and Kronecker is no exception. It features a simplified FM oscillator that is then run into a series of Resonators, with a sequencer that dictates when the oscillator triggers. You can have up to 4 layers with all of this going on to make a very big sound! For years now there have been a lot of shady "developers" who merely troll through GitHub finding open-source apps which they then lazily rebrand and try to sell on the App Store. In the "Music" category this has mostly been limited to Radio apps. AudioKit developer Matthew Fecher was the original developer who open-sourced his radio app, the code for which now pollutes the App Store with literally thousands on copy-cats. Now the scumbags are getting greedy. Luca Jaeger, an alleged shitbag, has released Wavetable Synthesizer Analog using the source code for Analog Synth X by Matthew Fecher and Aurelius Prochazka. While the original Analog Synth X is free, Luca's new "Wavetable Synthesizer Analog" is $9... with a weekly $1 subscription fee! You get nothing new in this app, nor even anything from the subscription. This is just a greedy cash grab! As Tom from Synth Anatomy points out, everything about this app is garbage. Even their contact page is a joke, with nonsensical phone numbers like 12345/67890, and an email address of info@website.com. So lazy. Avoid this and be wary; I'm sure more of these will arrive soon. You could also download the real thing for free!